Tonight, The Enemy Within episode 8 brought you an episode rooted in backstory; not only that, but also one that explained the complicated relationship with Keaton and Erica Shepherd that long preceded some of the work that they are doing now. Within this episode, we got a pretty clear sense of a grieving Keaton from many years back, one where he was dealing with the most devastating loss of her entire life. We know already how these four CIA agents died, but this gave you more context. It introduced the fear and the panic that Erica Shepherd felt when her daughter was first taken and the difficult arrangement that she apparently felt forced to accept — one where she helps Tal and secures her daughter’s safety, or goes against Tal and potentially loses her along the way. Did Erica make a cowardly move, or just a human move? In all honesty, we don’t even think that we’re qualified to even answer this question since we’ve never been in her situation. When she accepted Tal’s deal, she didn’t know what it would later bring or the consequences that would cause. Even if every little thing that has happened has been a part of his plan, that doesn’t suddenly make any of it okay. You could certainly see the toll that the whole crises was taking on her, as she was developing a short fuse with her daughter and struggling to maintain even some of her more basic day-to-day tasks. What was notable tonight was seeing just how early Keaton got a read on what Shepherd was doing, but also just how long he was forced to hold his tongue about it. If you’re bringing down a powerful person within the CIA — like the person who Shepherd was, you gotta be sure. You can’t take chances. It was through some phone records linked to her daughter that Keaton was able to finally nail her, and that set up perfectly the situation of her arrest. You could see in the way in which the arrest happened that, to a certain extent, she knew that it was coming. It was all a part of that plan, right? The only thing that wasn’t was that Keaton wouldn’t let her say goodbye to her daughter. At the end of the episode, we finally flashed forward to present day to Erica in prison, where she used her phone in order to get in contact with Tal. She made it clear to him then that she wanted to help him, and take an offer to a greater extent than she originally did. What does this mean? Is she playing him? 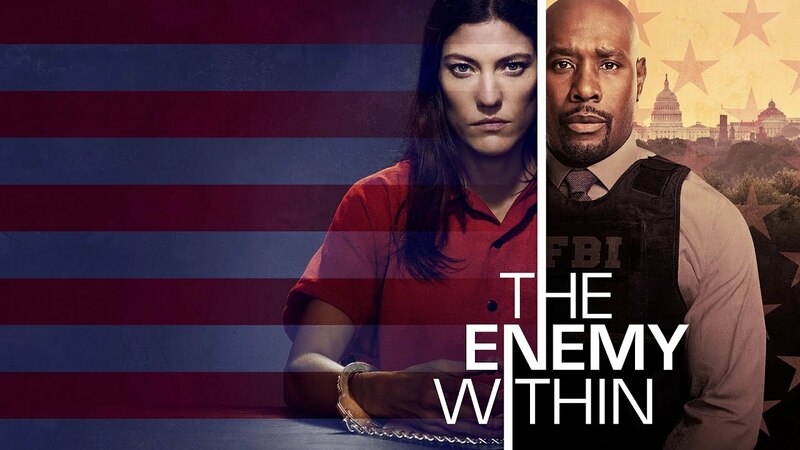 The best thing about tonight’s The Enemy Within was the performance of Jennifer Carpenter, who is clearly making the most of every little moment that she had through the episode. Some of these were powerful, and just about ALL of them were dramatic. Yet, through everything that we saw tonight, we do think that the central question still remains: Can we actually trust Erica Shepherd? Is she someone who is a friend or foe to Keaton now? This is a show that’s not only great at setting up a mystery; it excels at finding a way to continue it.